MHS junior Wesley Smith (12) delivers a pitch during the Marauders 12-5 win over Vinton County on Friday night in Meigs County. ROCKSPRINGS, Ohio — Runs in bunches keep the Marauders perfect versus conference opposition. 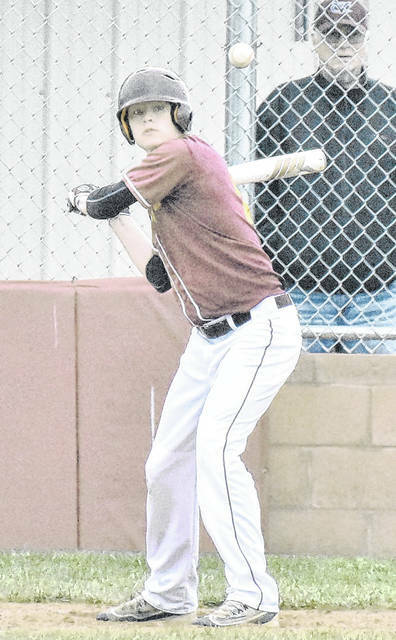 The Meigs baseball team utilized the momentum of an early 9-0 lead, as it defeated the visiting Vikings 12-5 to remain undefeated in Tri-Valley Conference Ohio Division play on Friday night in Meigs County. 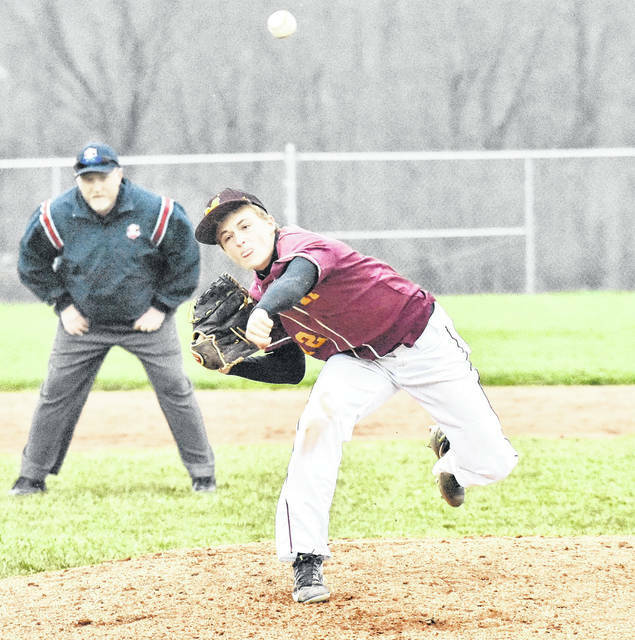 The Marauders (2-3, 2-0 TVC Ohio) surged to a 2-0 advantage in the first inning, as Cole Arnott and Zach Helton each scored to put Vinton County (1-6, 0-2) behind early in the contest. The Maroon and Gold tacked on four additional runs in the bottom of the second frame to extend their lead to 6-0, as Tyler Tillis reached on a one out walk to spark an inning capped off by a two RBI single by Zach Helton. MHS plated three more runs in the bottom of the third frame, as Cory Cox, Wyatt Hoover and Briar Wolfe each scored to lift the Marauders to a 9-0 advantage. The Vikings cut the deficit to 9-3 in the top of the fourth inning, as they sent seven hitters to the plated and manufactured three runs on three hits, one walk and an error. Vinton County added an run in the top of the sixth, when Noah Waddell began the inning with a walk and later scored on fly ball off the bat of Donnie Stevens to cut the lead to 9-4. Meigs extended its lead in the bottom half of the sixth, as Zayne Wolfe led off with a double and Brenton Young followed him with a walk. Bryce Swatzel was next and provided a two RBI double to propel the hosts to a 11-4 advantage. Swatzel later scored on a passed ball to put the Marauders ahead 12-4 entering the finale. The Vikings added one run in the top of the seventh, as Ryan Grisby reached on a walk and scored on a single by Bailey Bartoe to cut the lead to 12-5. MHS however closed the inning with no further damage to earn a seven run victory. Helton, Smith and Zayne Wolfe each finished with two hits apiece, respectively. Arnott and Cox concluded the hit totals for Meigs with one safety each. Following the game, Marauders head coach Brent Bissell was happy with his clubs performance — particularly its importance with maintaining an early positive record in conference competition. “Anytime you can get a win in our conference it’s a good thing for us,” said Bissell. “We are sitting at 2-0 right now and for us our number on goal is a league title so we are heading in the right direction. We got runs early in the game tonight. Meigs returns to action on Monday as they host the Golden Rockets in a Tri Valley Conference Ohio Division contest at 5 p.m.